Its ugly outside. It is cold, and rainy. There was thunder and hail. I am getting another cold. My life is going to get imminently more chaotic in the next week. Blah. So I have made some tea, had a smidgen of chocolate and cuddled my kitten. But you know what really cheers me up? Home tours! You too right? Haha. Well even if home tours aren't a sure-fire mood booster for you, I am sure you can appreciate this fun line up anyways. It's no secret that I come from Minnesota, land of (over) 10,000 lakes. And today's post honors that. We are going on a little tour of some incredibly luxurious, ridiculous, and astonishing lake homes in the Twin Cities area. I've, included just a taste of each, click the links for a full tour of each home. Fun fun. 1. Lake Minnetonka Residence by Murphy&Co Design. Set on its own peninsula on one of the most prestigious lakes. 2. Lake Harriet Residence by Stonewood. 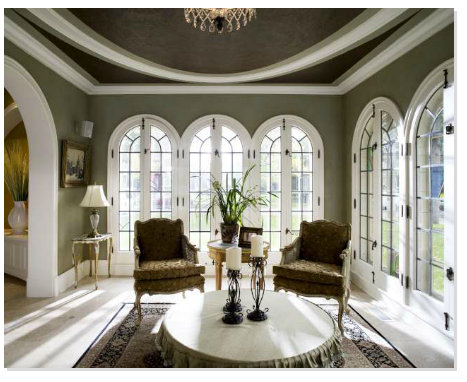 A part of the 2009 Luxury Home tour, features very elaborate detailing. No simple molding here; every surface has bevels, curves and trim. 3. Lake Calhoun Residence by Stonewood. Marble accents, marble floors, exercise room and sport court. Yet described on site as having "quaint charm". 4. Lake Harriet residence by Tea2. Is it just me or is the interior a little dated? Nonetheless, worth the entrance fee for those grand windows and view. 5. Northern Lake Residence by Tea2. Amazing mill work. The "living room" is like stepping into a royal sitting room. Oh and a turret. Really, if you have millions to build your dream home, not including a turret would be an epic mistake. 6. Lake Minnetonka Guest House by Joh Kraemer & Sons. Yes, just a guest house. I would love to be a guest in this lodge. 7. Lake of the Isles Residence by Charlie & Co. Much more my size. Lovely molding and coffered ceilings. And that concludes our Minnesota lake home tour. Maybe a Seattle tour next?